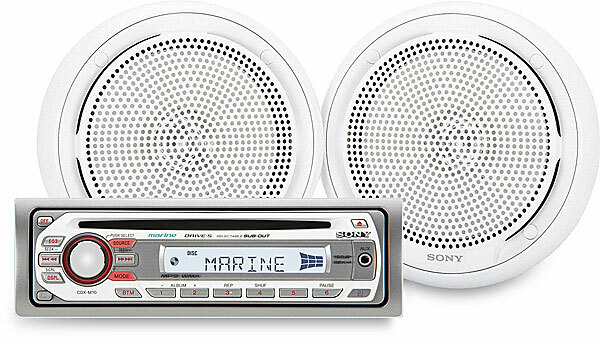 Get your favorite tunes onboard your pleasure craft with this marine audio system from Sony, featuring a seaworthy CD receiver plus a pair of sturdy marine speakers. The system starts with Sony's CDX-M10 marine CD receiver, which sports a protective coated circuit board and UV-resistant paint to ensure that it'll play for years on the water. You can play your store-bought and recordable CDs on the CDX-M10; load up a CD with MP3 or WMA files for a full day of music from a single disc. The 3-band equalizer tailors the output of the powerful built-in amplifier for the perfect blend of lows, mids, and highs. Roll out some extra bass by hooking a powered subwoofer to the preamp outputs. Enjoy your favorite playlists without headphones by connecting your MP3 player to the handy front-panel auxiliary input. Sony built the marine-tested XS-MP1610W 6-1/2" marine speakers to deliver great sound for the long run, with extended frequency response and solid power handling. You'll enjoy the added clarity and punch in your music when you're skimming over the waves. The Sony CDX-M10 Marine AM/FM CD receiver features a UV resistant faceplate (tested under ASTM G154), a conformal coated circuit board for marine use and a plastic cover over the top of the chassis to protect against humidity. Drive S: The CDX-M10 features the Drive S chassis platform. Drive S includes the CD mechanism, audio stages, 12 V power supply, and tuner section. The CD mechanism includes a suspension to resist shocks, a motor that draws less power, and a fast low-current pickup that improves durability and CD playback accuracy. The 52W Peak x 4-channel S-MOSFET Power IC produces clearer, more accurate sound, less distortion, and a higher signal-to-noise ratio than previous designs. Amplifier Section: The head unit's amplifier is CEA-2006 compliant and rated at 17 watts RMS x 4 channels at 4 Ohms and 1% THD. The unit is also rated at 23.2 watts per channel minimum continuous average power into 4 ohms, 4 channels driven from 20 Hz to 20 kHz with no more than 5% THD. Peak power is rated at 52 watts per channel. Disc Compatibility: The CD receiver will play CDs, CD-Rs, and CD-RW discs. The head unit also supports CD Text. ISO: The unit is compatible with the ISO 9660 level 1 / level 2 format, Joliet/Romeo in the expansion format, and Multi Session. Compressed Audio Display Information: The CD receiver's display can display the following information: Track number/Elapsed playing time, Disc/Artist Name, Album/Group Number, Album/Group Name, Track Name, Text Information and Clock. Best Tuning Memory (BTM): This feature selects stations with the best signals within the selected band and stores them in order of their frequency. You can select from FM1, FM2, FM3, AM1, and AM2. Manual Tuning: You can manually tune and find your favorite radio stations one by one for FM1, FM2, FM3, AM1, and AM2. Auto Tuning: You can use the seek button to help you search quickly through the available stations and then choose your own presets from these available stations. Loudness: This feature allows you to listen to your music clearly at low volume levels by reinforcing the bass and treble. The bass level is increased to +4 dB at 100 Hz while the treble level is increased to +2 dB at 10 kHz. Switchable Preamp Outputs: The CDX-M10 contains one pair of RCA preamp outputs which can be set for the rear channels or for subwoofer operation. When set to subwoofer, the output becomes non-fading and a low pass filter is activated with a selectable cut-off frequency of 125Hz, 78Hz, or Off. You can adjust the subwoofer preamp output's volume level independently from the head unit's volume control from -10 to +10 in 1dB increments. Front Panel Auxiliary Input: A front panel stereo 3.5mm mini-jack is provided to allow the connection of a portable audio source. Just connect your portable cassette, MD or MP3 player to this unit, and you can listen to the audio from the portable player through the speakers in your mobile audio system. The volume level of the auxiliary input is adjustable from -8 to +18 dB to compensate for any difference between the unit and your portable device. The aux input can be deactivated in the menu so it doesn't appear as an available source. The head unit comes supplied with a rubber cap that can be placed over the auxiliary input when it is not in use to keep it dry. Mounting Angle: For flexibility of installation, this unit can be mounted between 0 (horizontal) and 45 degrees. Display Illumination/Clock Display: Pressing the Off button once will turn off audio output, but the clock display and face/button illumination remain on. This makes the clock display and face/button illumination "Keyed" instead of "Unit On" only. To turn the unit off completely, you must press the Off button for two seconds. Auto Off: When installing in a vehicle without an accessory power wire at the radio location, you can set the unit to turn off automatically after a set amount of time. The Auto Off feature can be set to 30 seconds, 30 minutes, 60 minutes, or No. Dimmer: The CDX-M10 feature a dimmer mode to dim the brightness of the display. You can choose from either "Dim On" or Dim Off". Motion Display: This feature shows moving patterns and a spectrum analyzer on the display when turned on. Auto Scroll: This feature allows long displayed items to scroll automatically across the display when the track is changed on a disc. Eject: The CD disc can be ejected with the unit powered off. The CD player will automatically reinsert the disc if the disc is ejected and left on the lip opening of the player for 15 seconds or more. Optional Wired Remote Control: This unit has a 3.5mm minijack input for adding the optional PAC SWI-PS steering wheel remote interface (127SWIPS, sold separately). The SWI-PS interface allows you to retain the use of your steering wheel and/or rear seat radio controls when replacing the factory head unit in select vehicles with a Sony head unit with wired remote capability. UV-, Salt, and Water-Resistant Design: The Sony XS-MP1610W Marine speakers have a water-resistant marine design that is IPx5 certified. The white grilles, speaker baskets, polypropylene cones, woofer surrounds have been tested under ASTM G154 for UV-resistance and under ASTM B117 for salt-resistance. A set of stainless steel self-tapping screws are included. Polypropylene Dual Cones: Each speaker has a 6-1/2" polypropylene woofer cone and a silver poly "whizzer" cone that reject UV contamination and moisture. Each woofer uses a UV- and water-resistant treated cloth surround.